_MAL2153.jpg, originally uploaded by Michael A. Lowry. Thursday evening I joined Matt, Lisa, Daniela and Robban at Salveo for a few hours of climbing. While there, we made some new friends named Stefan and Tina. In the photo above, Tina leads a fun 6a+ route. I tried it later on in the evening and really enjoyed it. 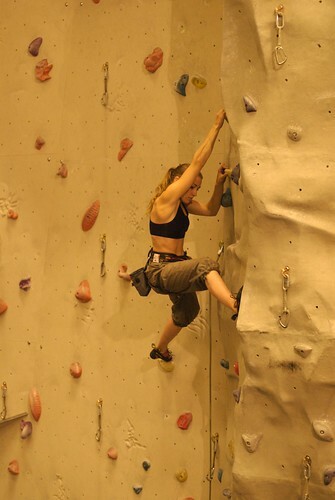 This was only my second time lead-climbing indoors. The toughest one I saved for last: a 6c that's just really pumpy at the end. The overhang is tricky and by the time you get there, you don't have much strength left. I had to rest on the rope a few times on the way up, but I finally made it to the top. Tomorrow if the sun shines as currently forecasted, Matt & Lisa & I will return to Ekoberget for some more lovely outdoor bolted lead-climbing. Here are the 29 photos I posted from last night's climbing.